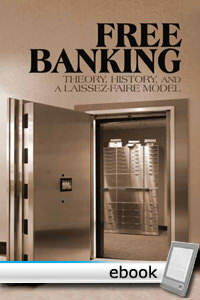 Free Banking: Theory, History and a Laissez-Faire Model by Larry Sechrest is a magnificent work, now rescued from undeserved obscurity with this new edition. Published in 1993, it is a formalization and extension of literature in the free banking area, with important correctives and clarifications. He argues that the debate over central banking and free banking is the most important economic issue of the day. Central banking accepts all the methodological precepts of socialist central planning. It is constructivist. The planners pretend to know more than they can know. They presume that their knowledge is better than the market. They use their power to override market signals of prices and interest. And the results are about as successful as socialism, and he proves this point with the first formal model of central vs. free banking, one that combines Hayek, Selgin, and Garrison to show that a competitive system would be self correcting where a centralized one is not. He goes further to analyze banking institutions in light of Say's Law which argues for the stability of macroeconomic phenomena in the absence of intervention. He further distinguishes the Austrian position from the monetarist one. Sechrest's attack on countercyclical policy is especially poignant today. He argues that even the most well-executed plan has no hope for success. Such policies fail because they are swimming against a market tide, and, moreover, monetary officials have no incentive to pursue socially optimal results; rather, their every institutional bias tends toward protecting the banking industry and the government before anything else. Sechrest contrasts this centralized model with looking at the detailed history, however, he finds serious problems in the case of free banking in Scotland, as described by Larry White. Sechrest goes beyond Rothbard and Sechrest's own journal articles on this topic to provide a full overview of the Scottish case. In contrast, he believes there is more to learn about the American case than has been previously known. Here he accumulates and presents vast data to show that free banking performed better than central banking by every standard that matters. The author then turns to the varieties of free banking theories, and contrast his own views with those of White/Selgin, Yeager, and Rothbard. He concludes with a wonderful theoretical round up of criticism of free banking. He shows that money is not a public good, that banking is not a natural monopoly, that central banking does not constitute a case of spontaneous evolution, and that we do not need a lender of last resort. He concludes "As long as money remains a tool of the state, that tool will continue to serve the state as a well-spring of income redistribution, social engineering, and military adventurism. A laissez-faire approach to money and banking is more than merely conductive to efficiency and stability. It is likely to prove to be the necessary precondition for prosperity, justice, and peace." This edition contains a new foreword by the author.